USER SCORE:82%The percentage of users who liked this based on high quality reviews from sources such as Google Play, iTunes, and Amazon Music. Above 75% is green. ? Not quite the slam dunk we expected from the Migos’ sharpest member. The last thing anyone would've expected from the group that turned trap into anime — complete with colorful "Versace, Versace, Versace, Versace" lyrics and outfits — is a mature solo spinoff. But that's exactly what member Offset has delivered with Father Of 4. Offset cements himself as a solo entity while delivering the most honest and vulnerable offering from the whole Migos camp. Father of 4, his debut solo album, moves away from his pricey product-placement raps and looks back on his life facing time for crimes against the law and the heart. Father of 4 does deliver substance, though sometimes it can be hard to separate actual weightiness from the mere appearance of it. Offset may be easier to say than Kiari Cephus, but on Father of 4, the man behind the gaudy ice pendants and random gossip headlines dominates the spotlight. Way to man up. Offset has set down a marker to his fellow Migos, urging them both to grow up. Father Of 4 sparks just enough joy to hold onto, if only for its sentimental moments. Father of 4 ultimately works as a solo outing because Offset is such a force of nature, but it’s too often cautious where it could be candid, or dull where it should be sharp. Offset's level of growth and candour on Father of 4 is that of an MC making leaps and bounds, both in his music and his personal life. His lyrical genius is clear throughout this album, but it's the way he switches up from his usual antics and provides context to his past and present life that truly makes him and this album great. ‘Father of 4’ is a fine body of work that builds a convincing case that Offset is currently best-placed to be Migos’ break-out solo star: once again, the final act of a trilogy proves to be the finest. Offset is attempting, often successfully, to showcase the humanity behind his frequently misguided choices. None of the lush instrumentals pop because its star doesn’t. “Father of 4” will likely be an unsettling listen, unless you are so ironically, sophisticatedly jaded as to shrug off everything as a mere joke, and still nod your head to it in real time. I thought this project was deep, it was pure, riveting and a lot of fun to listen to. 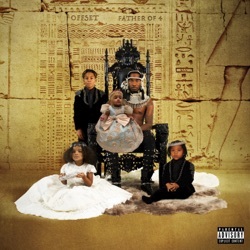 The more somber tone suits this approach well, but like most Migos-related albums, the songs still sound too similar to each other for Father of 4 to earn its lengthy running time. FATHER OF 4 is an album of great intentions but lacks in manifesting its ideas into great songs. 🗑 Really? Waited all this time for this?!? Can I get a refund?